Trinity School is a Healthy Howard, Healthy School! Trinity School has been a Healthy School for the past 3 years. In 2012 and 2013 Trinity School was awarded Silver Medals, and in 2014 Trinity was awarded a Gold Medal. The purpose of the Healthy Howard program is to create an environment of health and wellness that will engage the entire school community. · Trinity has two recesses a day for children in preschool through the 4th grade. Weather permitting, this gives our young students the chance to get some fresh air and exercise twice a day. 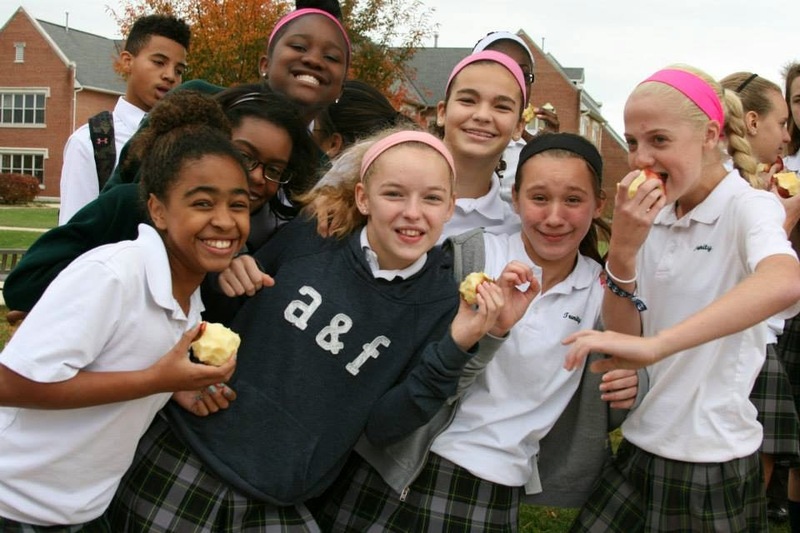 · Trinity participated in the Apple Crunch Day (pictured above). 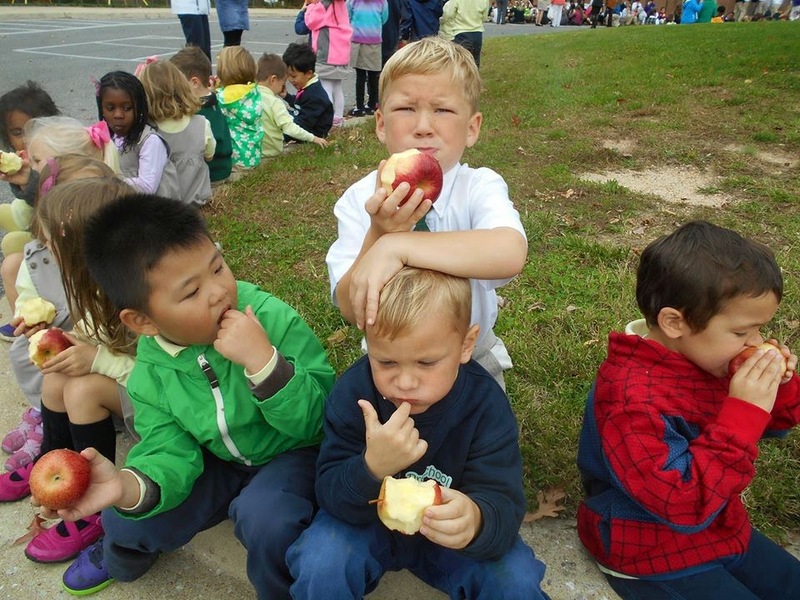 Held on Food Day, all Trinity students and teachers crunched into an apple at the same time. · The Trick or Trot 5K is a race held on a Saturday in October. What makes this event unique is that the course is contained on campus - no running on public roads with traffic. Students, parents, and alumni enjoy the chance to run around campus and see the Halloween decorations in the woods. There were 250 runners this year. · In addition to the Trick or Trot, there is lots of running at Trinity School. We have Girls on the Run, Cross Country, Track, and the Trinity Trot. All of this running takes place on our beautiful campus. · Trinity preschoolers are looking forward to yoga class during the winter months when it is too cold for the playground. One of our teachers is certified to teach yoga to young children. · There are no vending machines on the Trinity campus. · In conjunction with our Green School efforts, students are discouraged from bringing prepackaged snacks to school. Healthy snacks are provided in preschool and the extended day program. Students and parents are encouraged to pack healthy snacks. · Healthy living is part of the curriculum throughout the school. Preschoolers have are taught about nutrition and healthy eating. Second graders have a unit on My Plate in their Social Science class. Middle School students learn about nutrition in Life Skills classes. St. Julie said “Teach them what they need to know for live.” These are just a few highlights of ways Trinity promotes healthy living for life.